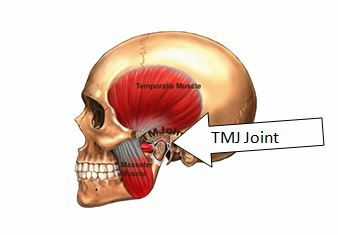 TMJ is an acronym for “Temporo-Mandibular joint” and refers to the joint that hinges the mandible (the lower jaw) to the temporal bone of the skull in front of the ear on each side of the head. We use this joint every time we talk, bite, chew, or yawn. It is one of the most frequently used joints of the body. The temporo-mandibular joints are complex and composed of muscles, tendons, and bones. Each component contributes to smooth movement allowing the upper jaw to close on the lower jaw. This joint is a typical sliding “ball and socket” that has a disc sandwiched between it. When this joint becomes displaced or when the muscles or ligaments surrounding the joint become stretched or damaged, simple movements become painful. We can locate the TMJ by putting a finger on the triangular structure in front of the ear. The finger is moved just slightly forward and pressed firmly while opening the jaw. The motion felt is from the TMJ. We can also feel the joint motion if we put a little finger against the inside front part of the ear canal. These maneuvers can cause considerable discomfort to a person who is experiencing TMJ difficulty. TMJ disorders are a group of complex problems of the jaw joint. This is also sometimes referred to as myofascial pain dysfunction because muscles and joints work together, a problem with either one can lead to stiffness, headaches, ear pain, bite problems (malocclusion), clicking sounds, or locked jaws. The following are behaviors or conditions that can lead to TMJ disorders. •	Teeth grinding and teeth clenching (bruxism) increase the wear on the cartilage lining of the TMJ. Those who grind or clench their teeth may be unaware of this behavior unless they are told by someone observing this pattern while sleeping or by a dental professional noticing telltale signs of wear and tear on the teeth. Many patients awaken in the morning with jaw or ear pain. •	Habitual gum chewing or fingernail biting can lead to TMJ pain. •	Dental problems and misalignment of the teeth (malocclusion). Patients may complain that it is difficult to find a comfortable bite or that the way their teeth fit together has changed. Chewing on only one side of the jaw can lead to or be a result of TMJ problems. •	Trauma to the jaws: Previous fractures in the jaw or facial bones can lead to TMJ disorders. •	Stress frequently leads to unreleased nervous energy. It is very common for people under stress to release this nervous energy by either, consciously or unconsciously grinding and clenching their teeth. •	Occupational tasks or habits such as holding the telephone between the head and shoulder may contribute to TMJ disorders. How do we do to treat TMJ disorders? Many TMJ related problems can often be successfully treated without surgery. Our treatment plans generally focus on calming the surrounding muscles and ligaments, relieving the pain and reducing the pressure on the joint. This can be achieved by performing chiropractic adjustments on the temporomandibular joint using a spring-loaded instrument called an Activator. We also reduce tightness in the muscles of the jaw (masseter) and neck using myofascial release muscle work. The use of Cold Laser Therapy is also a very effective treatment we use to treat and manage temporo-mandibular joint pain. This is an FDA cleared non-thermal (non-heat producing) laser capable of penetrating deep into tissue. Laser therapy has been successfully used around the world for over 25 years, with no reported long-term or irreversible side effect. Many seek relief from TMJ jaw pain through this effective non-invasive form of therapy before resorting to surgery. We have had excellent results using the non-thermal laser to relieve pain and promote healing of this painful issue. At times, it may be beneficial for your dentist to create a custom-fitted oral orthotic appliance. This is worn by the patient on either the upper or lower teeth and helps to relieve pressure and allows ligaments that have stretched to heal. 1. Sit in a comfortable position with your head centered over your shoulders. Keep your chin neutral and parallel to the floor. 2. Keep your head stable, relax your jaw and let your mouth open naturally. Put your index finger against your bottom teeth. 3. Press down on your bottom teeth, gently, while trying to close your jaw. Hold for five seconds, release and repeat five times. 2. Keep your head stable, and rest your fist under your chin. If necessary, sit a table and rest your elbow on the table to keep your fist stable. 3. Press up, gently, with your fist while trying to open your jaw. Hold for five seconds, release and repeat five times. 2. Keep your head stable, relax your jaw and let your mouth open naturally. Slide your jaw forward and back five times. Relax then slide your jaw side to side five times. 3. Slide your jaw clockwise five times. Change direction and slide your jaw counter-clockwise five times. 2. Keep your head stable and open your mouth as wide as comfortable and stick out your tongue as if doing a wide yawn. Hold for one second then release. 3. Repeat five times and relax. Tendonitis is the inflammation of a tendon, the bands of strong connective tissue that attach muscle to bone, which are often due to a repetitive strain injury. Repeated straining of a tendon can cause small tears that lead to the inflammation of the tendon. The fibrous tissues of the tendons have a relatively poor blood supply and are therefore slow to heal compared with muscle or bone. The pain, swelling, stiffness, and weakness caused by tendonitis can last for months or even years. This condition is common among athletes, computer users and those engaged in strenuous manual labor involving regular lifting which tends to overuse the tendons through repetitive motions. Pain in the forearm area and wrist is described as “tight, achy, and burning sensation”, similar to a pulled muscle. The swelling of the tendons from the wrist to the elbow can be extremely painful. Swelling, at times, will make it quite stiff with limited range of motion in the wrist. Routine activities such as turning a door knob or opening a jar can become impossible as it may be difficult to make a fist or flex the fingers. The pain is fairly constant but will increase with physical activity. It is also common to experience pain in the morning and during the night, when the arm is at rest. Some people describe hearing grinding sounds when rotating their hand or wrist. RICE it! R.I.C.E is an acronym for treatment used by people who suffer from forearm tendonitis. ‘R’ for period of rest, during which time one should avoid lifting heavy items or straining the muscles in any way. ‘I’ for ice. Applying ice can be useful in reducing inflammation and pain. Wrap an icepack in a towel and do not apply ice for more than 20 minutes at a time in order to minimize the risk of frostbite. ‘C’ for compression. Light pressure on the forearm has proven helpful along with keeping the arm slightly elevated (‘E’) when resting and applying ice, further helping to alleviate swelling. 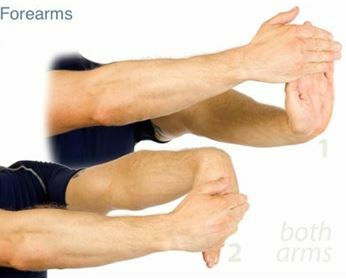 Gentle stretching of the forearms in w rist extension and flexion will help elongate the tendons of the forearm. Hold the stretch for 20-30 seconds and repeat for 4-6 repetitions a day. We are proud to offer laser therapy for tendonitis and various other musculoskeletal conditions we treat. Low-level laser therapy (LLLT) reduces the pain and inflammation and promotes healing by focusing infrared and visible red light on the injured tendon. The treatment is painless and the patient may feel a warm tingling sensation as the nerves are stimulated. Laser therapy for tendonitis may reduce the need for surgery and cut the healing time for tendonitis by as much as 50%. It may also help replace anti-inflammatory and pain medications. Photons (light energy) from the laser beam stimulate the cells of the damaged tissues, increasing cell division, circulation, and oxygen supply to the tissues, thereby promoting tissue regeneration. Laser therapy for tendonitis also promotes nerve cell regeneration. Call our office and let’s get started on your tendonitis treatment plan today! 802-655-0354. Your brain is no different than rest of the muscles in your body- you either use it or you lose it. You utilize the gym to stimulate the growth of muscle cells, just as you use a brain fitness program to increase connections in your brain. But you can actually get an additional brain boost hitting the gym. The benefits of physical exercise, especially aerobic exercise, have positive effects on brain function on multiple fronts, ranging from the molecular to behavioral level. According to a study done by the Department of Exercise Science at the University of Georgia, even briefly exercising for 20 minutes facilitates information processing and memory functions. Exercise increases the heart rate, which pumps more oxygen to the brain. It also aids the bodily release of a plethora of hormones, all of which participate in aiding and providing a nourishing environment for the growth of brain cells. 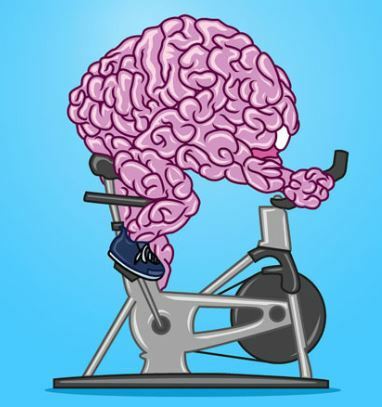 Exercise stimulates the brain plasticity by stimulating growth of new connections between cells in a wide array of important cortical areas of the brain. Recent research from UCLA demonstrated that exercise increased growth factors in the brain, making it easier for the brain to grow new neuronal connections. The usage of physical exercise in conjunction with brain training increases your chances of increasing cognitive functions within parameters, including time of exercise and style of exercise. Interestingly, differences between exercise styles, such as opting for cycling over running, is associated with an enhanced brain function during and after working out. Ballroom dancing, an activity with both physical and mental demands has had a higher impact on cognitive functioning over exercise or mental tasks alone, indicating that the best brain health workouts involve those that integrate different parts of the brain such as coordination, rhythm, and strategy. •	In general, anything that is good for your heart is great for your brain. •	Aerobic exercise is great for body and brain: not only does it improve brain function, but it also acts as a “first aid kit” on damaged brain cells. •	Exercising in the morning before going to work not only spikes brain activity and prepares you for mental stresses for the rest of the day, but also produces increases retention of new information, and better reaction to complex situations. •	When looking to change up your work out, look for an activity that incorporates coordination along with cardiovascular exercise, such as a dance class. •	If you work out at the gym alone, opt for circuit work outs, which both quickly spike your heart rate, but also constantly redirect your attention. •	Hitting a wall or mentally exhausted? Doing a few jumping jacks might reboot your brain. Now that America’s most passionate day of food consumption has passed, it is time to get smart about food choices and how it affects our body. 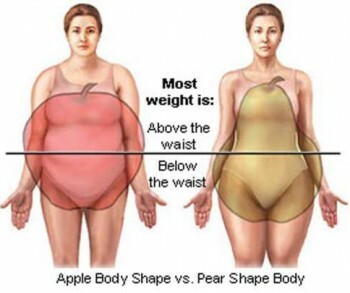 “Apple shape” is a popular term used for truncal obesity – fat that has accumulated around one’s middle. It is defined as a body-mass index (BMI) 30 and above, and a waist-to-hip ratio of greater than or equal to 0.88. Normally, obese people put on weight relatively evenly through their entire body. Sufferers of truncal obesity put on larger than normal amounts of fat around their midsection, often making them seem disproportionately overweight compared to others with the same BMI. Having any excess body fat above a standard range is unhealthy. The more overweight, the greater the risk for onset of chronic and serious illnesses. Unfortunately, suffering from truncal obesity as opposed to ‘normal’ obesity only makes the problem worse. This is because the fat is concentrated around the belly and digestive systems, as opposed to hanging off the legs, hips, and buttocks. Truncal obesity is associated with atherosclerotic heart disease and an increased risk of acute myocardial infarction, hypertension, hypercholesterolemia, diabetes, and increased blood pressure in the kidneys with an increased risk of kidney disease over time. It also weakens the immune system, decreases sexual performance, can trigger bouts of depression and other mental disorders, and is universally acknowledged as reducing the quality of one’s life. The obvious solution to treatment of truncal obesity is to lose weight, either by reducing your caloric intake of food or by increasing the expenditure of calories through exercise. A combination of both is strongly preferred by health professionals and will provide quicker, longer lasting results. Despite many infomercials and diet plan claims, you cannot ‘spot-target’ fat reduction. Try adding an exercise regimen that involves gradually increasing amounts of cardiovascular exercise. Using a diary to chart foods consumed and exercises performed is very helpful in charting your progress. Bottom line, in order to lose weight, calories consumed must be less than calories burned! Start now and your weight loss goals for 2014 will be in full-swing by New years! Many people sit at work these days. There has been a large amount of interest in designing the seated workstation with the application of ergonomic principles to reduce the likelihood of injuries. With the changes to a more sedentary lifestyle, we are encountering an increase in chronic diseases such as diabetes and heart disease. Current research shows that sitting for long periods of time is a risk factor for a variety of these chronic diseases. Prolonged sitting contributes to the risk of heart attack, stroke and metabolic syndromes. A study by Dr. Hidde van der Ploeg found that sitting for 11 or more hours each day increased the risk of death by 40% compared to sitting less per day. Added to this increase is the development of chronic diseases and the negative effects that accompany a relatively sedentary lifestyle. The fact is that Americans are getting bigger. The U.S. Centers for Disease Control and Prevention (CDC) states that nearly 36% of American adults are obese and another 33% of adults are overweight. There is increasing evidence that the seated lifestyle contributes to this increase. Use a standing desk. Working from an upright position burns more calories (20 percent) than sitting. Additionally, prolonged sitting has been shown to increase plasma triglyceride levels, decrease levels of HDL cholesterol levels and decrease insulin sensitivity. Take frequent office laps: Regular walk breaks helps circulation, helps to refocus the brain and helps to burn fat. Desk exercises: Perform exercises such as stretching while seated. Treadmill desk: This allows the user to walk at a slow pace while working. You can place a computer and a keyboard on a treadmill and type (work) while you walk. Yoga ball chair: Sitting on a yoga ball (aka Swiss ball, balance ball) helps to engage the core muscles and improved balance. Standing station: There are commercially available standing work stations, but improvisation is also acceptable. Active meetings: Instead of sitting in a meeting room, move meetings outdoors. Meetings wouldn’t last quite so long if they were not held indoors in meeting rooms with attendees seated comfortably in chairs. Of course, prolonged standing is not always the best position either. Movement is the key to remaining healthy. Workers should be encouraged to move from a sitting to standing position and back as frequently as possible. Vary your activities in the workplace and see if this makes a positive difference for you! Van der Ploeg HP, Chey T, Korda RJ, Banks E, Bauman A. Sitting time and all-cause mortality risk in 222,497 Australian adults. Arch Intern Med, 2012 Mar 26;172(6):494-500. Harper, Paul, Dynamic Chiropractic Sit or Stand? Strategies to Improve Workplace Health and Reduce Disease, Oct 1, 2013 p8,10. Benefits of using a foam roller is comparable to a deep tissue massage, myofascial release and myofascial trigger point therapy. Myofascial trigger points are taut bands or knots in the muscle tissue that can refer pain to other areas. For example, a trigger point in a gluteal muscle may refer pain down the leg. Trigger points can also limit range-of-motion, inhibit muscle strength and cause muscle fatigue. Regular work can increase flexibility and performance while decreasing muscle tension and pain. Make sure you roll on soft tissue and not over joints, ligaments or bony protrusions. Start by placing your body on a roller and slowly roll up and down the muscle. If you find a knot or tight band, hold that spot and try to feel the tissue release and soften underneath the pressure. Take deep breaths and try to keep your body as relaxed as possible. Position the roller so that it’s in line with your spine. To focus on your right side, roll your body to the left, keeping your spine parallel to the roller and stop on the muscles that run along the length of your spine. Hold and allow your back to relax. Repeat on the left side. Position yourself as shown placing the foam roller between your ribs and hip. Slowly roll backwards until you feel a stretch and pressure in your lower back region. Hold on tight spots until you feel the tissue soften. Do not hold on any one spot for longer than a minute. Be careful not to over-treat. Repeat on the opposite side. For gluteal muscles, piriformis:Start side-lying on the foam roller. Extend your right leg so that it’s in line with your torso and rotate back to position your right gluteal on the roller. Bend and place your left leg behind your right and place both hands on the floor for support. Proceed to roll the right gluteal region along the roller. Repeat for your left side. Foam Roller Techniques, OPTP, 2008, Michael Fredericson, MD, Terri Lyn S. Yamamoto, PhD, Mark Fadil, CMT, p. 15, 17, 23.